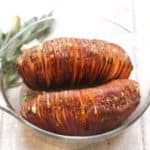 Liven up the humble potato side dish with these Hasselback Sweet Potatoes, also known as Hedgehog Sweet Potatoes in our house! Wash the sweet potatoes under running water and scrub them to remove any dirt. I also like to cut the ends off. Using a sharp knife make a cut into the potato and keep cutting until you are about 3/4 of the way down. The idea is to keep the bottom of the potato uncut so that the top fans out but the whole potato still stays intact. Continue to make cuts into the potato all the way along. It is up to you how thin or thick to make your slices. Once both potatoes have been cut, place them into a baking dish. I would recommend a smaller dish where the potatoes sit quite snugly as this will ensure that they don’t collapse as the potato cooks. Add slices of garlic into some of the slits, sprinkle the oregano on top and then drizzle on the olive oil. If you want to add some extra flavour add the rosemary sprigs on top of the sweet potatoes. Bake the sweet potatoes in the oven for between 40 and 60 minutes, depending on their size. Remove the rosemary before serving.